The Friday 56 is hosted by Freda’s Voice, it involves sharing a small excerpt from the book you are currently reading every Friday and then posting a link to the linky hosted on her site. 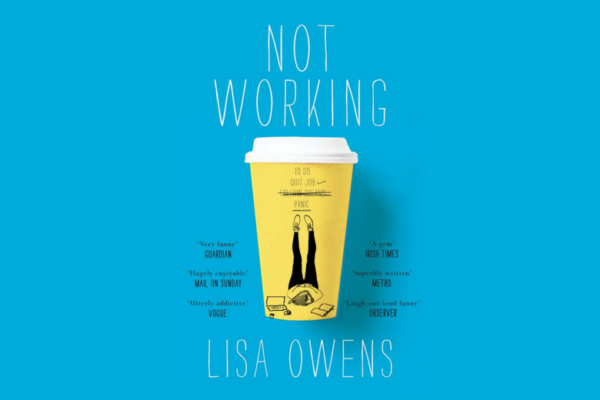 This week I chose Not Working by Lisa Owens. *Add your (URL) post in Linky. Add the post URL, not your blog URL. I have almost finished reading Not Working and overall I have really enjoyed it. A few things I found a little unrealistic, ( the main character Claire just happens to have bought a house in London with her brain surgeon boyfriend) but if you just accept that this girl is really lucky and has loads of savings, it is a really funny book. I also really appreciate that her boyfriend is a genuinely nice person! I was getting a bit fed up of reading about messed up relationships that seemed to fill the protagonist’s life. There is definitely love-life drama here, but it is all Claire’s fault, not lovely Luke’s! I would quite like to meet a Luke! I can relate to a lot of what she says, and the quote I chose is one of those sentences that made me laugh, I have definitely been there! Trying to figure out what it is you are meant to be doing is so hard! When searching for a new career, we all tend to romanticise those things we have never done or imagined doing. Check out my last Friday56 post! wait, what is kittenfishing? another online dating term we all have to be scared of. apparently. Having been a teacher, I laughed too at just how unrealistic her perception was. My teasers are from a historical mystery – A Conspiracy in Belgravia by Sherry Thomas. Happy reading! This looks like an interesting. Also, I really like the cover. Me too! That shade of blues perfect and the coffee cup to-do list is so clever! You have me so intrigued for more!!! Happy weekend! Yay! I’m so glad, thanks for hosting! Loved your 56! Now you have me wanting to meet Luke. 🙂 This sounds like a great book. Thank you for sharing! I hope you have a great weekend. Luke is just genuinely nice! I think books need more Lukes! You too!